I know we all want to be #1, but we already have among the best classes ever signed at Bama. Many of them are already enrolled. We're good. Looks like we'll finish #1 anyhow, but I'm good with it if we don't. Folks on TiderInsider are predicting us to miss on Sopsher (not surprising) and To'oto'o (disappointing). I'll hold my breath until his LOI is in but looks like the folks at TiderInsider were RONG!! This one is a major SHOCK to me. He'd been trending to LSU for the past month. HUGE GUY and HUGE RECRUIT!! You can now mark down Alabama as the #1 class for 2019, even though he dropped from 5-star to 4-star. He needs the weight room and conditioning drills. He'll be a dominant player. LOI is in per TideSports. Ishmael Sopsher has been a top target for Alabama and LSU since the 2016 season. He is big body on the defensive line out of Amite, a powerful program in Louisiana and this one went back and forth to the final minute. Sopsher looked to be a fairly strong Alabama lean for much of the fall and into early winter, but LSU really made a strong push at the end to close the gap. Even with all the coaching changes in Tuscaloosa, Nick Saban and the Crimson Tide won out. WR Devonta Lee announced he'll "attend the University of LSU". 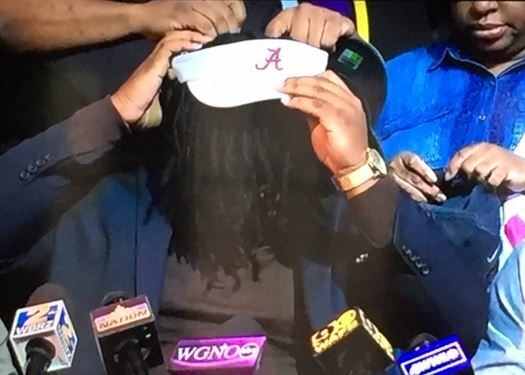 4-star RB Keilan Robinson announces he's signing with Alabama, as expected. Sopsher gave a very nice presentation. His whole family is BIG. They couldn't find a helmet big enough for him in the all-star game. He even has big hair! Hope he turns out to be successful. You can't even see his face!! To'oto'o is the last great player that Alabama has among their top targets. Coming up in next few minutes. Henry To'oto'o is a 4-star INSIDE LB from Concord, California. He was considered a stretch recruit for Bama, especially with all of the west-coast teams after him. But now Bama's considered to have a good chance at signing him. Hope so. We'll know in a few minutes. Inside LB Henry To'oto'o picks Tennessee!! Big for the Vols. Big miss for us.